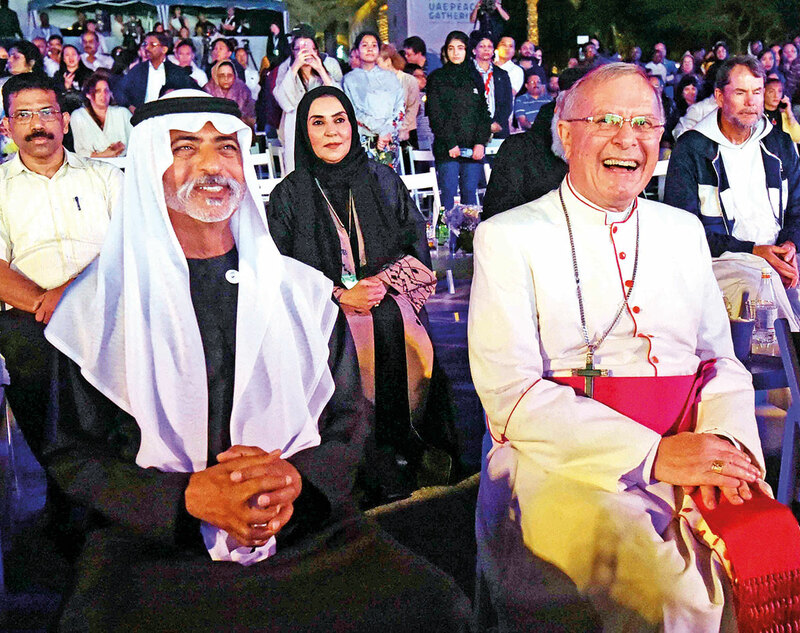 Abu Dhabi: Residents from all walks of life came together on Friday in Abu Dhabi as part of a peace gathering to celebrate the country’s religious harmony and coexistence. 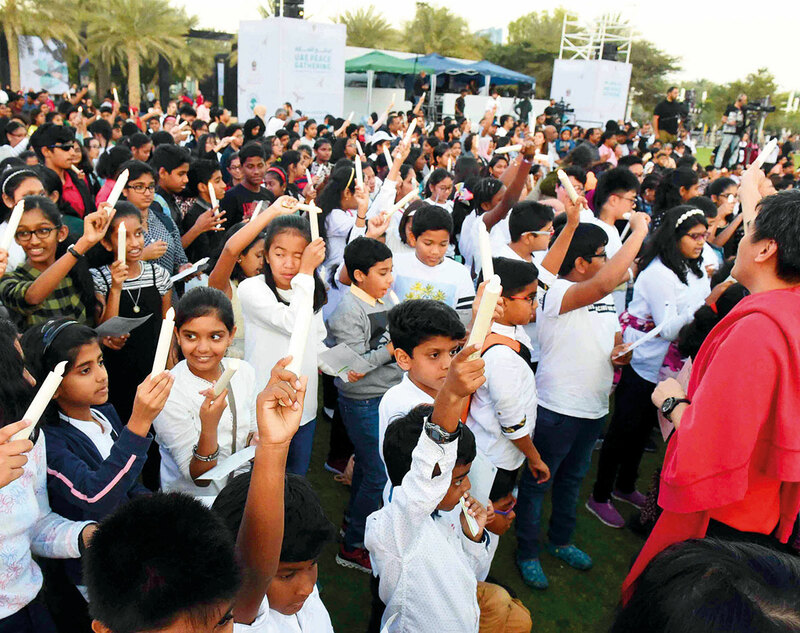 Organised by the Ministry of Culture and Knowledge Development, the celebration at Umm Al Emarat Park featured several musical performances from different cultures as well as film screenings. “His holiness the pope [Francis] and his eminence the Shaikh of Al Azhar [Dr Ahmad Al Tayeb] are both global symbols of peace, compassion, and brotherhood,” said Shaikh Nahayan Bin Mabarak Al Nahayan, Minister of Tolerance, who officially opened the festive activities. “The UAE is a country which is firmly rooted in its Arabic and Islamic belief and heritage, from which we are able to confidently and peacefully interact with those from other cultures and religions. Today’s event is a continuation of our desire to better understand each other and to share our own culture with the world,” he added. Mohammad Abdu, an Egyptian tourist visiting the park with his family, welcomed the event and said that interfaith dialogue was much needed in today’s society. “It’s good to make people from different religions understand and learn from one another; the more you learn about each other the better it is for society as a whole. “Gatherings like this from time to time is an excellent thing, it helps to build bridges and bring peace in society,” he added. Nusina Shukoor, an Indian resident who attended the peace gathering with his family, also said he was looking forward to the visit of Pope Francis next week. “The pope visiting the UAE sends a very positive message for the Muslim world, I am very happy and excited that he is coming here even as a Muslim. “At the end of the day, we are all brothers and sisters, it doesn’t matter if you’re Muslim or Christian or whatever faith you follow, we all need to come together to spread the idea of peace and tolerance,” he added. Filipino resident Jeremy Baclagan commented positively on the intra communal relations in the UAE, and said he hoped that it would set an example for others. “Peace gatherings like this send a good message about the UAE and how we’re all living together as one community. In today’s world where we see division and conflict we definitely need more peace. “I’m very happy as well to see the pope coming to the UAE, I think it’s good for both the Muslim and Christian community, as his visit will further strengthen religious dialogue and relations,” he added.